New Belgian joint-venture launches latest 3D imaging and gesture-recognition technology - competition brewing for Microsoft's Project Natal? A new joint venture from Belgian specialists in 3D recognition software and 3D sensing tech could provide some much-needed competition to Microsoft's heavily hyped Project Natal when it launches next year. The leading specialists in 3D recognition software at Softkinetic have partnered with inventors of a patented 3D-sensing tech at Optrima, with the lofty claim that they are now able to offer the most complete 3D depth-sensing imaging and gesture-recognition technology available. Developer-friendly SDKs for the new iisu tech are already available now and also being offered to OEMs as an all-in-one product, which companies can easily incorporate into their own gaming and other consumer devices. One of the first to take up the technology is Texas Instruments, with other 'big announcements' on the horizon according to the new company. Softkinetic-Optrima is set to port its 3D gesture recognition middleware "directly onto TI's intelligent digital signal processors" as well as providing "direct support for OptriCam, SKO's 3D imagers product, to TI-based development boards." More interestingly Softkinetic's CEO Michel Tombroff has hinted about a major upcoming deal about which he could reveal no details as yet, but "was obviously brimming with enthusiasm for SKO's goal of getting affordable gesture recognition apps into homes across Europe and the US by the end of 2010." 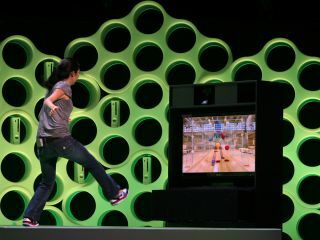 Microsoft's Project Natal is due for release around the same time, later in 2010. We live in interesting times. Huzzah!